I've been on this blue kick lately. This blue. I bought this gigantic strip of fabric at my thrift store a few weeks ago. I only bought it for the colour and almost hesitated because it's pretty cheesy looking, polyester, nylon type fabric. If you can call it fabric. Trust me, it's weird, buying something like this after years of training myself to spot beautiful natural fibres. Anyway, I made some curtains for my craft room, and boy they looked good. Of course, being on this blue kick, I started to carry a swatch around with me. I just ran out of yarn the same colour yarn recently and really, really wanted more of that too! So having the swatch should help with that I hope. I'm hoping it will work like a divining rod. Oh, I should say I'm over my yarn snobbery as well. So much for pure wool, when I'm strictly hunting for colour. Acrylic will do just fine for kitsch crochet. So, while I was hunting around I thought I would add orange to the mix and found this pillow! Of course once I got home I had to pull anything orange from my stash. The fabric on the lamp shade was pinned on in a temporary manner, just to see if it could work. 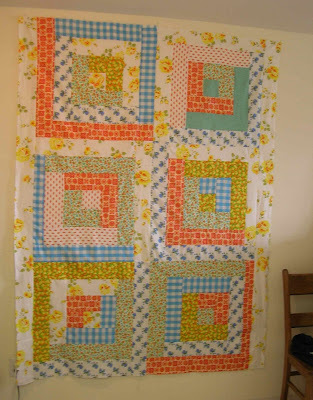 If you want to see this quilt, it's here. Then of course I started painting things, like this picture frame. Hmm, need a picture there! Speaking of kitsch... I only have those kissing salt and pepper shakers, because they were in a bag with another pair, the ones I really wanted. They're growing on me though, because of the colour! I have to say, I've recently become heavily influenced by the colour combinations over at the amazing Dottie Angel. She has, to me a very sophisticated colour sense, using unique combinations of vintage inspired turquoise blue, olive green, pink and gold. If you like colour and vintage, she's a must! If you're a colour fanatic, or know of those with blogs you could suggest, please introduce yourself and/or share the link! Oh, I have to add that the curtains didn't work. I couldn't figure out why at first, but then I realized that it gave the room a cold feel. I think they will become curtains for the closet instead or possibly I will save them for the next summer heat wave. wow, like the curtains. And it seem to change up the colour a bit when the light hits it. nice find.